The announcement of the Nobel Prize winners every October means that at least once a year a handful of economists become relatively popular. We can observe this spike in popularity using web search data reported by Google Trends. 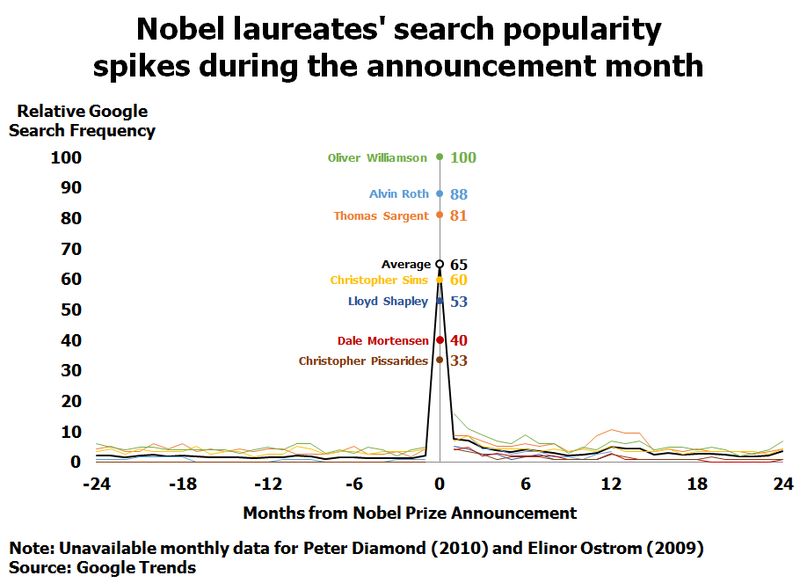 The chart below traces each Nobel laureate’s popularity before, during, and after the Prize was announced using an event study framework (see here for a discussion of event studies). The chart shows search data for every laureate who received an award in the field of Economics since 2009 except Peter Diamond and Elinor Ostrom because these laureates’ data aren’t available on a monthly and consistently-scaled basis. 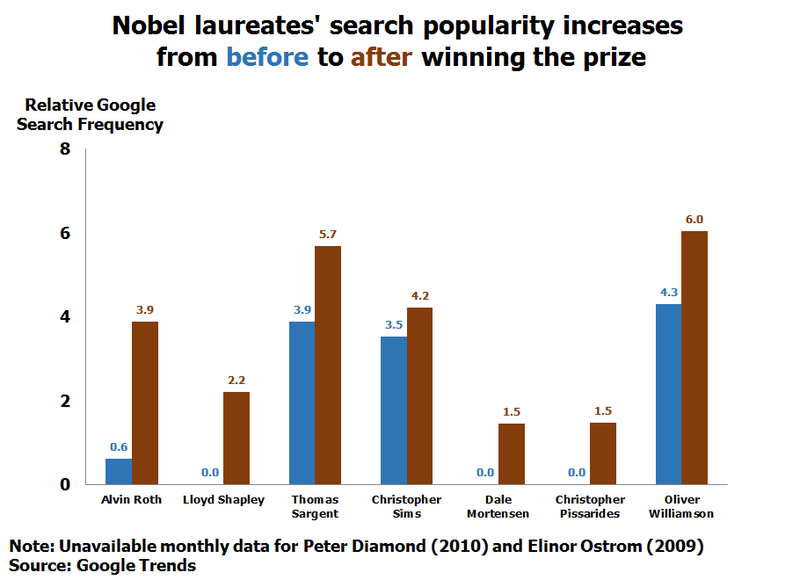 Prior to the Prize announcement, Google users rarely searched for the future Nobel laureates. This isn’t surprising because most economists are virtually unknown to the general public, especially before they receive a Nobel Prize. As expected and as the chart above shows, the month in which the Prize is announced coincides with a large spike in search frequency. What’s more interesting, however, is that the honored economists’ popularity doesn’t last long. The chart above also shows that shortly after the Prize is announced, public interest subsides quickly and drastically. Another chart (shown below) simplifies the before/after comparison by reporting the average monthly search frequency before and after the Prize was announced. Although search frequency increased for every laureate analyzed, the magnitude of these increases appears modest. On a percentage basis, however, the increases in search popularity are substantial. Alvin Roth, for example, saw his average monthly popularity increase by 550% following the announcement of his Prize. In spite of these relative increases, the first chart above and our event study suggests that the popularity decreases so rapidly that the month immediately following the announcement has search results that are on average ten times smaller than the spike. According to a recent academic paper, Economics laureates’ popularity in academic circles is also fleeting. 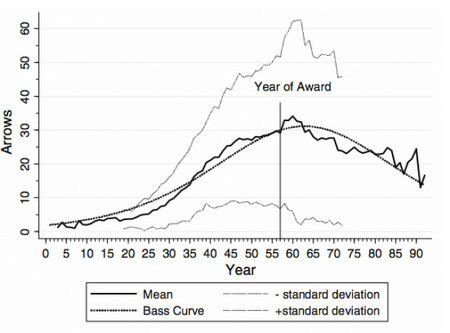 The paper finds that, on average, Nobel Prize-winners’ citation counts increase modestly following the award and then decline quickly and monotonically thereafter. The chart below, which is excerpted from the paper, shows this trend. Despite these trends that indicate the fleeting nature of Nobel-induced popularity, winning economists no doubt value their Prize highly as it recognizes and rewards their academic careers in a way that few other prizes or honors can.